. :: FEI WORLD EQUESTRIAN GAMES™ TRYON 2018 LOGO AND PROMO VIDEO UNVEILED ::. Omaha, N.E. - March 31, 2017 - Tryon International Equestrian Center (TIEC) unveiled the FEI World Equestrian Games™ Tryon 2018 (FEI WEG) event logo and promotional video at the 2017 FEI World Cup™ Finals in Omaha, N.E., on Friday, March 31. Held every four years in the middle of the Olympic cycle, the 2018 FEI WEG will be held September 11-23 at the Tryon International Equestrian Center (TIEC) in Tryon, NC. 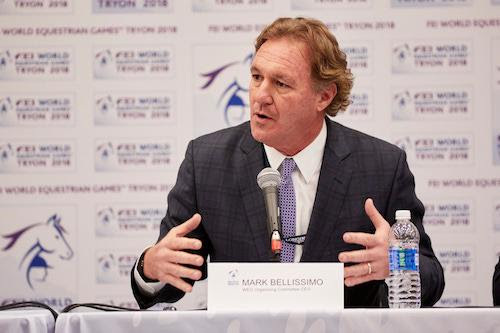 The press conference was hosted by key members of the FEI WEG organizing committee, Mark Bellissimo, CEO, and Michael Stone, President and Sports Director; alongside FEI Secretary General Sabrina Ibáñez, and U.S. Equestrian President Murray Kessler. "We are thrilled to launch the brand and rally enthusiasm for the 2018 Games," said Bellissimo. "The promo video is only a taste of the action and entertainment fans can expect when they come to Tryon in September 2018." "It's truly great to be part of today's launch and the start of the countdown to the 2018 Games in Tryon," FEI Secretary General Sabrina Ibáñez said. "We couldn't ask for a better venue to host our flagship event and we are already working closely with Mark Bellissimo and his excellent team to produce absolutely top sport next year." 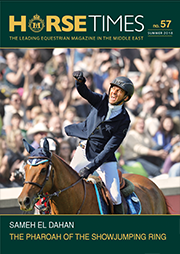 U.S. Equestrian President Murray Kessler stated, "A great way to bring the joy of horse sports to as many people as possible is to run major championships in this country and do it incredibly well. I think it's critical that you have a community that embraces [the event] and I think you'll find that in North Carolina, and Tryon specifically. Hopefully as a result, there will be more fans and spectators for horse sports." FEI WEG President and Sport Director Michael Stone noted, "We have assembled a team of some of the best organizers in the world for each discipline. We organize most of these disciplines already at our events, so we have people who know how to run top-level FEI events. We are on target for our organization and planning for the sport in all eight disciplines." 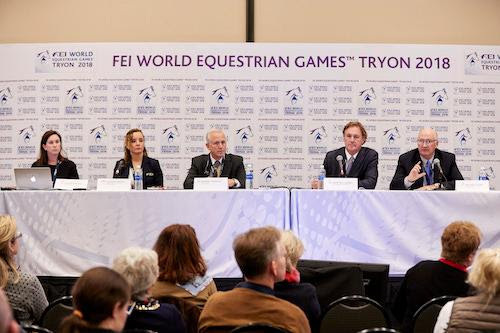 The release to the media included the FEI WEG logo reveal and promotional video launch, facts about the 2018 WEG, as well as the test event dates, FEI WEG schedule, ticketing information - which will become available in June - and credential information. Video from the press conference can be viewed at the FEI YouTube Channel. The logo, animated logo, and promo video can be seen on the FEI and Tryon2018 Facebook pages, along with further information about the FEI WEG. The FEI World Equestrian Games™ is the world championship event for eight equestrian disciplines - Jumping, Dressage and Para-Equestrian Dressage, Eventing, Driving, Endurance, Vaulting and Reining, and is the most prestigious equestrian event in the world. More than 500,000 people are expected to attend the 13-day event.